This page works in tandem with the Attribute and Person Fields tabs in Security Roles. 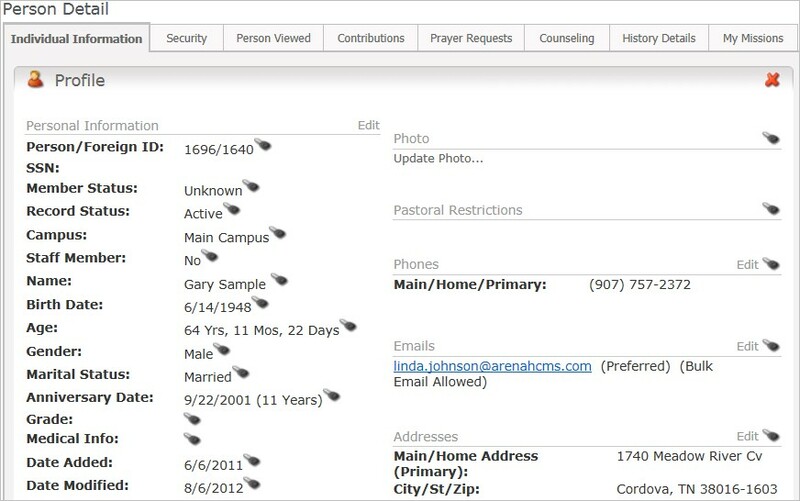 While the record Arena displays is the current user logged in, security settings apply to all records. Due to the nature of this function, it is best practice to limit access to this page. 1. Click the Security icon of any field or section you want to adjust. 2. Make desired changes, by Security Role or by Individual. Any changes also update the respective security roles. 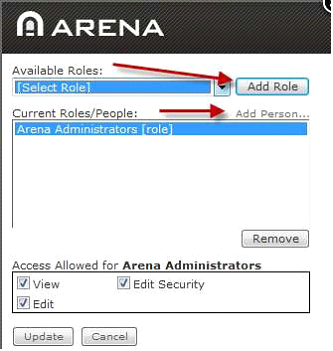 To display all field security options for the Person Detail page and for Arena to starting applying your security roles to this page, set Secure Fields to “True” on the Person Detail module on the Individual Information page. 4. Click the Edit Settings link in the top right corner. 5. Select the Individual Information page in the Module drop-down list. 6. Set the Secure Fields setting to true. In this same module, you can also restrict which security roles can delete records. 7. Set the Allow Delete to true. 8. Select the security role(s) that can delete records. 10. Click the Done button.